Here’s what happened with Willie: Lassie, Will and I had just finished a lovely country walk with friends (two and four-legged) and were chatting outside of the house of the mutual friend who owns the property. Picture: three people talking outside of the house, three dogs at their feet, and Willie, the 4th dog, hanging out, fifteen feet away. Willie began to leave the area and walk down a path edged with tall prairie grasses. He quickly moved out of sight, and since there was a wandering, unaccompanied two year-old child in the area, I wanted to keep an eye on him. I called him back and asked him to stand and stay. He did, until I turned my head for a few seconds toward my friends. When I looked back, Willie was gone. I called him back again, told him to sit and stay. “Willie, do you want to go to the car?” I asked, and he turned and ran to the car. I followed him through the prairie grasses, and found him at the car door, looking back and forth between it and me, like Lassie in a movie with Timmy trapped in the well. I put him in his crate and walked back to Lassie and my friends. As I did, I remembered that TWO YEARS AGO, the dog we had walked with today went after Willie over a stick in exactly the same area. There was no contact at all, but an impressive bark/charge that clearly scared Will (he urinated as he rolled over submissively). There has been nothing between the dogs ever since, but they used to play lots of chase games together, and now they don’t. Will, alpha-wanna-be that he is, will always be a dog with a lot of fears, and as he matures, he tries to hard to find ways to stay out of trouble. He avoids situations of conflict and he play bows frequently (I taught him to do that to help him relax; he does it often now, I think because he’s learned it is a way of managing tension). I can’t help but think what it would have been like for him if I had interpreted his behavior after the walk as a “challenge to my dominance.” What a nightmare for him, and what a betrayal of our relationship that would have been. Meanwhile, back at the farm, I continue my crazed, obsessive gathering of summer’s bounty. There are now 12 quarts of black raspberries in the freezer, along with heaven knows how many packages of strawberries, rhubarb and now cherries that I picked from a generous friend’s tree yesterday. This weekend I’m going after Blueberries at an organic farm down the road. I made a Blueberry, Strawberry, Raspberry pie yesterday. This ‘eating locally and seasonally’ sure is fun and ecologically a good thing to do, but it’s not helping me control my waistline. Tonight I take a rest for harvesting, and take Will to work sheep at a friends. Oh boy, she has a huge field so we can try a 300 yard outrun. Oh boy, can’t wait, I’ll keep you posted. 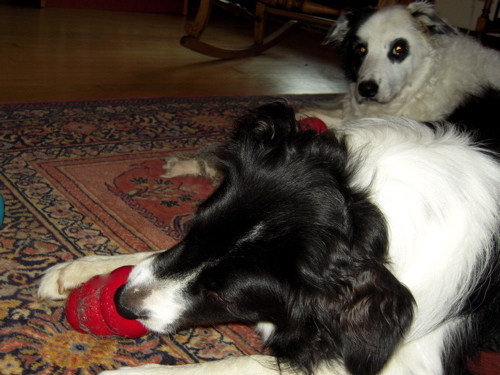 Here’s Will and Lassie this morning, chewing on their stuffed Kongs, and illustrating for all the world to see that I didn’t vacuum the rug this weekend. I have two Old English/Black Lab crosses, the female is 2 and the male 1.5 years old. Loompa, the female, is much more sensitive to her surroundings than the male. Both love a long walk across a farmer’s field or back a wood road. On a couple of occasions, in a place we have walked on a regular basis, Loompa suddenly paused and then refused to go any further. She sniffed the air, listened intently, looked at me and quietly began trotting in the opposite direction. I called her. She stopped immediately and looked at me but would not come any closer. After a moment, she began heading the other way. A few yards later, she stopped, turned and looked back to see if I had followed. Since this reaction is totally out of the norm, I did not call her again but followed her back out, with her stopping every few yards to check that I was coming. I don’t know what she heard or scented, but obviously she felt it safer to go the other way. The next time we were there, our ramble continued as usual. What she sensed, I don’t know, but I was willing to trust her more acute senses. It’s a good point! My dog can be a little on the pushy side with people, seeing how far she can manipulate them, but she rarely tries that with me. I have learned that if she is restless, and simply won’t settle, no matter that she knows exactly what I am asking her to do, she needs an unscheduled potty walk. Or her water bowl is empty! Or a thunderstorm is approaching. She’s generally very well-behaved with me because I know all her tricks and don’t play the game. But one day when she just wouldn’t settle, I figured I must have missed something. It was just so unlike her to persist this long and she looked uncomfortable, not just trying her luck. So I asked her a bunch of questions-Do you want x,y, z? ‘Go out’ was the thing she wanted. Even though she had been out within the hour, sure enough, she had an upset tummy and needed to go again. She was telling me that yes, I should take her out and save my carpets! Glad that I listened. It was her persistence and a restlessness that I can’t quite put my finger on that told me I was missing something in the equation. When I see those two together, I realize that I am just not understanding what she needs. I know my mom would have gone down the ‘poorly understood dominance’ route and had a mess to clean up, an upset dog, and general unhappiness of canine and human varieties. I really worry for dogs whose owners view every interaction with them as a contest of sorts! Good reminder. We expect them to listen to every single word we say, so listening back is the least we can do, isn’t it? I just had one of these moments yesterday. Tova came and got me where I was knitting on the couch with her “Please?” look, and when I asked her if she wanted out, she said no (by dropping into a down). I was so tempted to say, “Well, forget it, then–busy human here!” but she looked awfully sincere, and she’s generally good about giving up if it’s not important. I followed her…into the kitchen right up to the stove, where the big pot of water I’d put on was boiling vigorously. Which was her point, of course. And I had, indeed, forgotten. What a beautiful story demonstrating the benefit of knowing, really knowing your dog! “Translating” a specific behavior in a specific context depends not just on you noticing in the moment of The Look, but also on you noticing the impression the initial interaction made. Having given your dog choice rather than compelling behaviors so many times in the past has no doubt contributed to your understanding of what Will might want or need in a specific context, what he might do to try to get it, and, ultimately, who Will is. How do we encourage people to invest the time, convince them it is worthwhile to achieve this level of intimacy with their dogs? How to we teach the necessary sensitivity? Especially, when, in human society, few people rarely achieve this level of relationship with another human? It isn’t magic, but there is something undeniably magical about this level of partnership with a being that doesn’t lie. Kudos! This does happen often, if one is open to it. I always feel honored to share (or have noticed!). My last Lab mix (now at the bridge) was very understandable. I was the slow one. We trained SAR and a refind. Once, during yet another ankle injury (pattern? ), he was bored with staying inside. He was trained to ring a set of bells to go outside and had perfected that for food and water as well. He rang the bells, I told him to go on out, since the back door was open to the yard. He rang again harder and came to stand in front of me. Oh, heck, I thought. We spent all that time (3 times – LOL) learning the refind, so why not use it? I told him to come, touch and show me…. he took me right to the kitchen chair where is halter collar was hanging. “Do you want to go out for a walk?” OH, YEAH! He jumped up in front of me, practically bouncing with glee that I had figured it out so quickly! I am one smart cookie! During a visit to my cousin’s out of town, he gave me a similar message to Willie. He was restless in their yard and not at all comfortable. We did the touch, show me… he took me right to the car where he curled up happily in his crate until after dinner. No big jumps on this one, just a calm “thank you.” Gotcha, Pal! Sometimes they are so clear! Thanks for your blog, Trisha! We love it! Rather than go into my own details, I would love to pursue the context of MEMORY in our dogs..and your insight into this ……apologies if this is too simple to ask! I can’t resist — I have nothing to add on the K9 front, but your rug? You’ve got to be kidding, right? You seem to keep up a pace that would put many people to shame and you didn’t get the rug vacuumed? First, as if we noticed! (not) and second, who cares. Sounds like what else you did over weekend was lots more fun! I’ve always maintained that in exchange for asking my Brittany to listen to me I must listen to him to retain his respect. About two weeks ago we were up at our cottage, taking a walk down the lane when Mick stopped dead. I encouraged him to keep going, but he wouldn’t budge. He was on a long-line, and I walked a bit farther ahead to see if there was anything scary. Suddenly, a beagle burst out of the bushes to my left. He wasn’t immediately aggressive, but was eying Mick very suspiciously. I shooed the beagle away (thankfully he was a bit less aggressive than he looked) went back to Mick and walked away. In training I always try to give Mick a choice to obey, I just try and make it more appealing to listen to me than disobey. I don’t always succeed (bird-dog extraordinaire would rather point or chase something than come when called, most of the time) but I find that if you don’t give them a choice they resent you for it. And PS, your rug looks better than mine! Love the blog! I love the interspecies communication that opens up when the human views instructions to dogs as cues- an opportunity for the dog to possibly earn reinforcement, instead of commands- do this or else. I have one dog who often tells me he’d rather go in the car, and another who would often rather stay home- I don’t always honor their choice, and if, after they’ve told me (by where they stand) I ask them to do the other, I don’t get any grumbling, but sometimes, I do listen, and change my mind. Arie is my baby (she turned 2 yesterday!) and will regularly tell me when she is uncomfortable by coming and putting her paws up on me and looking over at whatever is scary. Depending on what the situation is, I might leave, or ask her to sit on the other side of me, or even approach it- and she trusts me to make an appropriate decision, as I show her I can understand her needs. I googled Ms. Lord and found that she is an evolutionary biologist. I think that I understand how Willie felt there. When I was maybe 7 or 8, I was playing catch with a friend in the back alley behind our house. One of our adult neighbor’s, who had clinically diagnosed emotional problems, came out of his house and unprovoked, punched me in the head, hard enough to break his hand. It took me a very long time to even be able to walk passed their house, which was limiting to me as they lived between my parents’ house and the homes of many of the children on our block. Even well into my high school years I would feel a dread if I saw him walking on the street, so it is a credit to Willie’s resilience that he is able to walk with the other dog, even if they aren’t best friends any more. Something similar to Willie’s experience happenned to my puppy, Darwin, a six month old neutered male beagle, this Sunday. The thing is he panicked which is worrying to me. We got to the park early for off leash, so there were only a few dogs in the park at the time. One of the larger dogs had a ball and another dog went for it and a fight ensued. As I was standing closest to it, I got in between them to try and split them. It took maybe 15 seconds to get some control over the situation, but in that time, Darwin had panicked and took off across the field and only stopped because the field ends at the top of an 8 foot retaining wall, which thankfully Darwin didn’t jump off to the street below. I tried to call him, but as he was about 100 yards away and still in a panic, he wouldn’t come. I don’t think he even registered it. As I walked closer, I kept calling him and he finally started to hear me and tried to find me. Then at about 20 yards he worked out that I was there and came over. I put on his leash and tried to feed him a treat but he wouldn’t take it. He then started barking at a person walking perpendicular to us, something he never does. It took him a long time to calm down and even longer before he started to play with the other dogs again. But for the rest of the morning he kept checking in with me, something that he almost never does when there are other dogs around. I started to think about the incident and thought that it might have been that I was in the middle of it that caused Darwin to panic, but then I realized that the dog that tried to take the ball that touched off the fight was probably the same dog that a few weeks ago had bark/charged Darwin down a hill and into a park bench before his owners could pull him off. Last night I took Darwin to the park again, figuring lets get right back in the saddle. He was doing okay until another loud growling match started and he started to take off again. I was sitting on the ground right where he started to run and I was able to catch him immediately. I held him in my lap and fed him a treat and tried to help him to calm down. He did, but I think he was very insecure at that point because I took my hands off of him and there was another puppy trying to get him to play and it took him several minutes before he would leave my lap to start to play again. For the rest of the night he was practically velcroed to me and wasn’t that interested in playing. Every angry growl even though none were directed at him sent him running back to me. He even tried to jump into the lap of a friend of ours a few times as she was sitting closer to him. I am heart broken for him over this as he has up until now absolutely loved going to the park and playing with the other dogs. His unbridled joy at running, wrestling and playing with the other dogs was amazing to watch. So this very uncharacteristic behavior really concerns me. The prior two months of him going to the park, he has always been a confident dog around other dogs, with several owners commenting on his fearlessness at such a young age, but the last two days have left me at a loss for what is happenning or what to do. It has been about a month since he started to get wary of unfamiliar people trying to pet him, but I though that might be slight adolescent fear, which I figured I could help him with by having strangers feed him treats, but now I am worried that I might be doing something that is turning him into a fearful dog. I am really at a loss for what to do. Right now he is strong and lean and I don’t think that leash walks alone will be enough to meet his exercise needs. I would hate to have to keep him out of the park for offleash runs, but I don’t want him to have so many fearful experiences that he becomes reactive. I really wish I could talk to him in English to find out what he needs from me or what it is that is troubling him. I don’t know if you have already seen this, but it’s fun! I pay close attention to my dogs and horses. We were riding down the road one day when my normally extremely cooperative mare stopped dead. I asked her to go on but she wouldn’t budge, she was staring into the woods ahead…..and pretty soon a doe and 2 fawn came walking out on the road. My dogs are clever too, one will roll the water bucket around if empty, several have learned how to open doors to let themselves in when out, one who is usually very good about coming when called has shown me to be watchful if she does not come in…..twice it was a nest of newborn bunnies she found, once 2 robin fledglings. It’s so refreshing to know that it’s OKAY to listen to what your dog is trying to tell you. Taking the time to stop and put one’s ego or “schedule” aside and let your dog tell you what he needs from you. I had this moment with my little beagle George. He was used in train and play classes to teach alternative play behaviours to adolescents. I thought this was really cool, and he seemed to really enjoy it….he’d take things in stride and the majority of the time, other dogs listened to his body language without him progressing further than his “look” when they ignored everything else along with his play bows. Well I thought he did, until the day he was blindsided (which came with the job at times) by another rowdy dog. He got up and went straight for the door. He ignored my recall, and just stood with his face to the door. I left with him, I thought maybe he needed to pee, and when he stopped in his tracks not wanting to go back in…we left. Me feeling like a horrible person. How could I have put my ego first. It just stopped my heart, made me loose my breath and made me feel really really horrible to have put my “this is cool” ego booster feelings infront of what mattered most, and that is my George. I’m supposed to protect him. And I felt like a failure, but as always in failure comes insight and something to learn. I have since had him in classes to play, and I am the match maker of his play pals, and I hope I’ve regained his trust. form respectful relationships with animals? I guess we all just do what we can, whether it is writing books, posting blogs or role modeling that behavior around others. It helps me to remember that our relationships with animals has changed profoundly in just a few decades, at least that is true of many of us, and that is a blink of an eye in biological time. Patience, however, is not my strongest suit, but I am in good company with you all, encouraging a better and more respectful relationships between people and animals. I did want to say a few words to Kate especially, who is feeling badly about George being blind-sided. I hope you can pick up any guilt you have and toss it away like a bag of spoiled vegetables (think rotten tomatoes!). I can’t see that you did a thing wrong, and the fact is, life happens to all of us, and we can’t always protect those that we love, whether human or canine. It seems to me that you did everything right: you immediately responded to your dog’s signals, both to let him and out and then not force him to go back inside. What could you possibly have done differently? Yes, I know, you somehow magically could have prevented it in the first place . . . if you could look into the future and predict what would happen?! I suspect that George has made no association between you and the event, and is grateful, in some flop-eared canine way, of your sensitivity. Speaking of sensitivity, poor Alessandro and Darwin. My heart goes out to you both. I can’t treat this like a ‘case’ but I can tell you that 6 months can be an especially sensitive age. I would not hesitate to keep him away from the park for awhile, even though I know he used to love it. He clearly was traumatized, and trauma can turn into PTSD, even in dogs, especially if the trauma is repeated. I would get him back playing with dog buddies in other contexts, and once he seems less reactive and recovered in general (maybe consider some alternative supplements, herbs, acupuncture?) you could begin to take him back to the park when it is extremely quiet and IF the bully dog you describe isn’t around. I think, most importantly, give him chances to enjoy other dogs in contexts out of the park, only a few at a time. Don’t feel a need to rush things at all, but do what you can to have his experiences with other dogs be low key and positive. Good luck…. I’m sure others will have some good advice for you too. Years ago I was walking through the woods with our Swiss hunting hound Sandy. It then happened a similar thing as Joan described with Loompa. Sandy wouldn’t go along the path I figured out. First I thought that he is just stubborn, but his eyes told me that he really wanted me to go the other way. So I followed him and … when we were only a few meters away from the path a huge branch fell off a birch, exactly on the place I stood. Dear old Sandy, it’s more than twenty years he is gone now, but our hearts still sob. George and I ended up revisiting your Fiesty Fido book for a refresher for a bit …of what to do in his meet and greets with strange dogs ON LEASH. I didn’t expect to see the anxiety transfered to on leash, and I could be wrong, but it’s the only thing I could think of that would have impacted him. Maybe just coincidence, I don’t know. I thought with the flight part of the equation being taken away on leash (even though I always have slack lead) + residual anxiety from the blindside = he would start barking before meet or after the sniff part of a meet and greet. It’s all part of the journey I think. The more I experience and thankfully have author’s/ professionals (Alice of Dogsmart is my fav) as yourself to refer to, whatever I learn, I can share with others. My last foster Jake whom I worked with using Feisty Fido techniques and attended Out and About class with just went with his new family 1wk ago and she bought Feisty Fido! !, I’ve since provided her with the link to the update. The way I see it, the more I go through, the more I share, the more people learn about positive reinforcement, reward based training and wonderful people such as yourself get to touch another soul. Good luck in Africa! Big hug out to Willie for being his quirky self, and again thank you for sharing the story with us. I have a story of a different kind of listening. I have several Aussies, and my older girl, Cinder, is my most reliable poultry finder. Not only will she track them down, but she won’t bite them when she finds them and they refuse to move. Instead she points to them, or if they are moving she heads them back to me to catch. I recently got some chickens from a friend who is moving, and several of them immediately “flew the coop”. I got Cinder out and told her “find the chickens” and she put her nose down and sniffed out a couple of them for me to catch. There was still one missing and I thought it must be in the woods so I took Cinder there and had her search. She led me back to the barn and pointed to one corner. I looked there, moving piles of boards and things to look under- no hen. I called her back to the woods thinking it might be behind the barn, and she led me straight back to the same corner and pointed. Again I looked all around and could see a chicken. Repeated the woods search with the same result. The third time she pointed the corner I happened to look behind one of the support timbers in the barn and there was the chicken, wedged in, hiding and right where she had pointed every time. I have a story of a different kind of listening. I have several Aussies, and my older girl, Cinder, is my most reliable poultry finder. Not only will she track them down, but she won’t bite them when she finds them and they refuse to move. Instead she points to them, or if they are moving she heads them back to me to catch. I recently got some chickens from a friend who is moving, and several of them immediately “flew the coop”. I got Cinder out and told her “find the chickens” and she put her nose down and sniffed out a couple of them for me to catch. There was still one missing and I thought it must be in the woods so I took Cinder there and had her search. She led me back to the barn and pointed to one corner. I looked there, moving piles of boards and things to look under- no hen. I called her back to the woods thinking it might be behind the barn, and she led me straight back to the same corner and pointed. Again I looked all around and could not see a chicken. Repeated the woods search with the same result. The third time she pointed the corner I happened to look behind one of the support timbers in the barn and there was the chicken, wedged in, hiding and right where she had pointed every time. Many states (if not all, really don’t know) have Public Land reserved for hunting and wildlife viewing. These public spaces allow dogs off leash the majority of the year… in WI the time is roughly Sept thru May. These areas are not fenced of course, but are usually in rural areas vast in acreage and away from busy roads. This does mean, however, you would need to have a solid recall, compelling toys, or some other means keeping your pup safe. Also must avoid busy hunting seasons and check the schedule, which you can do by visiting your state’s (assuming you live in the U.S.) Dept. of Natural Resources website. I love the healthy dose of nature the public lands provide (much wilder than the dog parks nearby me) and have found that most hunters prefer other places to go, making these spaces relatively free of any type of traffic. Great for one-on-one bonding with your dog. As such, not a place to take a dog to socialize unless you’re meeting friends there, but outstanding for games of frisbee or fetch, scent games, and running. Some folks go to practice with their hunting dogs, and I have met some amazing Labs, Pointers, and Setters with whom my dogs seemed equally impressed. Aside from the DNR Public Lands, there are also Dog Trial Grounds exclusively for training hunting dogs. Very different crowd than the dog park, but no one has ever balked at me for using the area just for recreation. The hunters I’ve met genuinely seemed to be true dog lovers and conservationists; if you can appreciate what they’re doing on some level, they seem to appreciate you, too. Best of Luck, and hope this gives you an option or two to add to your repertoire. This is actually an issue that I’ve been facing with my dog recently and it’s really nice read this blog about it. Both my dog, Willow, and I are new to competitive obedience and although she has one leg toward her novice title, lately every time we go into the ring she seems more and more stressed out; to the point where she can’t hear me at all. I decided at the last show we went to to pull her from the second day because it just seemed like we were doing more harm than good. I still haven’t identified what is causing her fear, but I firmly believe that we have to respect our dogs when they’re giving us signals this strong. Rather than falling into the “challenging our dominance” theory, as you said. Thanks! @ Chapel Taylor. If your dog is having ring stress, you might want to look into APDT RALLY Obedience. (http://www.apdt.com/po/rally/about.aspx). APDT Rally is more relaxed then competitive obedience and the different exercises and flexibility of Rally might be a way for you to help Willow become more comfortable in the ring. In APDT Rally, you are allowed to talk to and praise your dog throughout the entire course. In addition, you are allowed to treat and reward after certain exercises and many of the Rally exercises will be helpful in competitive obedience ring. In addition, the APDT Rally judges (and community at large) are very understanding and we have all had issues to work through with our dogs. So if you find in the middle of a run, that your dog is stressing or not focused and you want to make it a training session and pull out the treats that is fine. Or if you feel it is just better to stop and leave the ring, people understand that too. It is all about you and your dog having fun and positive interactions. Yes, I have had that kind of communication before with my dog and my cats. And I do give them requests versus commands. For instance, on a Saturday morning, Torie will go outside in the back and I ask her if she wants to come in (if it is truly ok either way). I’ll say something like “Torie do you want to come in or would you like to stay out longer?”, and she will give me a look and I know it means– I want to stay out longer. Or else I might get one that indicates “I want to come in”. I had a very dear cat (one of those once in a lifetime cats, now deceased). It was very strange as any animal training book out there will tell you to speak in one or two words, but he always seemed to understand better if I spoke it sentences like “would it kill you just this once to try this litter”. And sure enough he would! I know this is anthropomorphic as can be, but I don’t care. And I feel that he told me it was time to leave this world. I can bet that many other animal people will say the same thing. Yes, I am very happy not to be in competition with my dog (could one even suggest this with cats??) for “dominance”. BTW, Karen Pryor describes some “thank yous from dogs”–they certainly seemed that way to me– in her most recent book. And Trish, I don’t think any of us care about your carpet. Thanks for your wonderful blog. I’d like to share a recent experience from last night that illustrates the point that we should consider making what I’ll call a “differential interpretation”of our companions’ attempts to communicate with us.In my work life as an M.D.I always have a differential diagnosis for any given constellation of signs and symptoms.I live with a husky mix named Atim(dog in cree) who had a difficult start to life.He has made tremendous progress using positive reinforcement but will probably always represent some risk for biting.Recently I made the decision to introduce him to a basket muzzle and have started the process by feeding him his meals in the muzzle.Supper went well tuesday as did breakfast yesterday.Our usual routine for the evening meal is that he eats after I eat and my dishes are done,i.e.he has licked every molecule of food substance off my plate and the cooking vessels.Last night I got out his new food bowl,put some kibble in it and held it out to him and he started barking in a way I have never heard before ,a high pitched whiny bark accompagnied by an agitated pacing around the house.Everytime he looked at the muzzle he became more upset so I put it away and put his food in his usual bowl.He was still agitated but not as much.I called him to sit and look at me before releasing him to eat but then he just sniffed the food and started pacing again with occasional repetition of the high pitched whiny bark.He seemed to want to go outside so out we went where he proceeded to have diarrhea.Over the next five or ten minutes he gradually calmed down.My interpretation at the time was that he was reacting to the muzzle,that probably in the the four months he spent in a cage in the shelter between five and nine months of age he had at some time been muzzled ,and that for some reason he suddenly recognized what I was holding in my hand. Given the degree of stress he seemed to be showing I started to dispair that it would take months to get him to see this piece of equipment in a positive way.Wrong!!! I got woken up at a little after midnight and again at four a.m. by a pacing whining dog who has the runs.His agitation last night was frustration at me for not recognizing he needed to go out RIGHT NOW.When I think back over last night he was asking me in a subtle way to go outwhile I was eating which I interpreted as him being especially hungry. He also did a so-so job on the dishes,not leaving them pristine apart from a layer of saliva.By the way he ate breakfast just fine in his “new bowl ” this morning. Coming home from work one night, I opened the slider on our back patio and gave her the release word to go outside. She ran up to the slider and abruptly stopped before breaking the plane of the opening. I said, “what is wrong with you?”. I gave the release word again and added a hand signal. She did not budge but just looked up at me with a clear intention not to move…neither out the door or back into the family room. With a liitle more frustration and conviction in my voice, I again gave the release word and an even more animated hand signal…but again, she just sat there and stared at me. In my infinite human wisdom, I decided to step outside to show her myself just how silly she was being. Just as my body broke the plane of the slider opening, I heard a very distinct rattle. I froze half way through the door, and then slowly pulled myself inside the house and slowly shut the slider. I then turned on the patio light only to see a 10 foot rattler curled up on the hot patio cement just to the right of the door opening. After that experience, I have never asked my dog to do something she doesn’t want to do and instead have tried to figure out what is preventing her from feeling comfortable enough to do it…for her benefit…and perhaps more importantly mine. P.S. Years ago, my husband and I were robbed while we were sleeping. At the end of the police interview, I asked the officer what other safety measures we could take to better protect ourselves. He said, “Ma’me, the best safety measure anyone can take is to get a dog!”. We were between dogs at the time and it hadn’t occured to me that our dogs over the years had provided another service other than just unconditional love. Although we’ve never been without a dog since and the officer’s words have never left me, it took a rattle snake to remind me that the presence of a dog is only part of the equation…you still have to be willing to listen to your dog…and not assume you’re always smarter. What a wonderful story of communication and respect. I’ll tell one about my dog Bruce. Bruce was Bruiser for 10 years and spent all his time living on a chain in his owner’s yard. He was the pup of the owner’s collie mix by a neighborhood golden newfie mix and he grew to be a large bronze fellow. Sadly he was very neglected for many years and then in the last few years often abused by his increasingly disturbed owner. Finally a neighbor was able to negotiate his release and she rehomed him with me. He swiftly proved to be a lovely dog and adapted beautifully to being in a home and living in partnership with a person. He was naturally very nicely mannered, so much so that I never really felt the need to train him and had to cram it all into a swift 15 minute session just before he took the CGC/TDI test which he passed with flying colors. The only time he was at all annoying was when I was working on the garden in the back yard and needed to go in the house. Everytime I did he would get between me and the house essentially tripping me as I tried to get around him to reach whatever it was that I needed. It was very unlike him but I just let myself get frustrated and pushed him aside until finally I caught a look in his eye that stopped me in my tracks. I asked him if he could wait in the yard and let me go in for my stuff my eyes signaled him to move to my left–something he would normally have done on that cue. He didn’t–instead he purposefully moved more directly between me and the door. I said do you want to come in with me? he immediately moved out of my way to my side. I brought him in with me and then back out a minute later after I grabbed whatever I’d gone in for. Now that I was watching I realized that whenever we were outside he always placed himself between me and the house and essentially ensured that he was never left in the yard. He was now a house dog and he was taking no risks. What wonderful stories. My two dogs have shown me many times that they have a lot to sayfor themselves if I take the time to listen, and that it is always worthwhile to do so. Most recently, my guys ran to the front door and insisted someone was there. I saw nothing through the peephole, but my younger lab kept following me and poking me with his nose, taking a few steps to the door then looking back to see if I was following. This was unusual, so I opened the front door expecting that perhaps a neighbor had left a note. Instead I found my neighbors senior dog who had recently had surgery and had apparently panicked when her owner stepped out for a minute. She managed to open a locked screen door and I guess stopped at the first place that had friends. We live not far from a busy road and there are occasionally unfriendly dogs that are allowed to roam loose. I hate to think what could have happened if I hadn’t been home and my dogs hadn’t alerted me! On another occasion my older lab literally dragged my husband over to a drainage culvert, whining, extremely insistent. Almost completely out of sight in the culvert was a stray dog that had been hit by a car. Fortunately we were able to locate the owner and the dog recovered, but she’d managed to run over 2 miles from her house and was completely unnoticeable to a human. Dogs never cease to amaze me. We adopted a wonderful loving part poodle part bichon frise from our local animal shelter. He usually obeys us and is a wonderful companion. When he accidentally is locked out however , he refuses to bark even though we call and look everywhere for him . Today I went up on our roof to admire the view. I thought I was alone and when I was through enjoying the view, I went back in the house and locked the door. A half hour went by and I wonder where he (Curly) was. I searched the house and my husband looked all over our village and we offered a reward to everyone we saw. Later, I remembered going up on the roof so I unlocked the door and and sure enough there he was, he had quietly followed me there and refused to let his presence be known or to answer my call. He was quite happy to see me and promptly followed me inside. How can we teach him to bark when he is in trouble or lost?